What Elements Are Needed to Prove Battery? HSF Trial Attorneys > Battery > What Elements Are Needed to Prove Battery? There were 1.28 million violent crimes across the country in 2017. The rate of violent crimes has steadily decreased since the 1990s. When you’re charged with any type of crime in Atlanta, you have reason to be frightened, overwhelmed and anxious. If you are convicted of the crime you’re charged with, there will be lasting consequences. You may face jail time, not to mention stiff fines, court costs, and other fees. As Atlanta battery defense attorneys, we know that you are looking for somewhere to turn. Hawkins Spizman Kilgo is here for you and will stand up for your rights. We understand that part of your emotional turmoil lies in the unknown. You may not understand exactly what battery is or what it means if you are found guilty. When you take the time to become informed, you are better able to work closely with your legal advocate to fight the charges against you. If you have been charged with battery in Atlanta, the prosecutor will be tasked with providing several elements in order to secure a judgment. Here is what you need to know about battery in Georgia. Georgia Code 16-5-23.1 outlines the definition of battery. According to the law, a person commits battery when they intentionally make physical contact of a provoking or insulting nature against someone else. They may also have intentionally caused visible bodily harm to the victim. Visible injury in the case of battery means an obvious sign of violence like a contusion, swollen lips, and cuts. Hidden signs like internal bleeding aren’t visible, but they’re still injuries and may be grounds for a battery charge, depending on the unique circumstances of the situation. Georgia typically doesn’t count emotional or mental abuse as a form of battery, like some other states do. There are exceptions, of course, but the victim in most cases must have apparent physical harm. People often use the term “assault and battery” to describe certain crimes. It’s important to understand that Georgia holds these two offenses as being separate. In other words: Battery is not assault. In order for a person to be charged with assault, they must have intended to cause apprehension to a victim and that the victim did believe that a harmful act was about to occur. 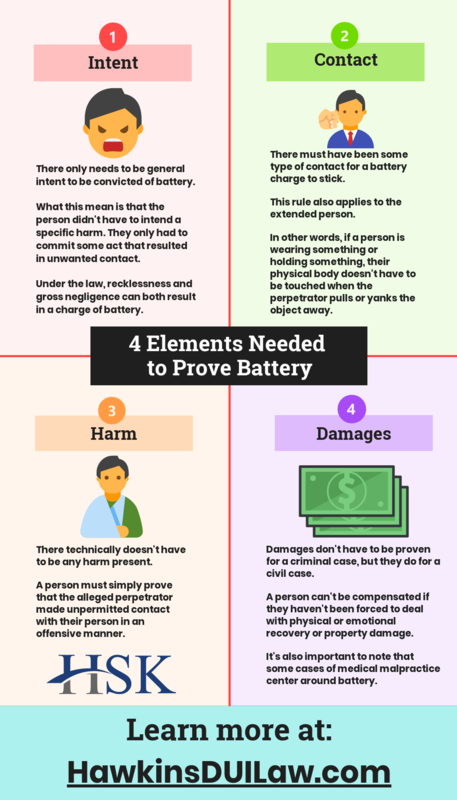 There are four things that a prosecutor must be able to prove in order for a person to be convicted of battery: intent, contact, harm and damages. Let’s take a closer look at all four. There only needs to be general intent to be convicted of battery. What this mean is that the person didn’t have to intend a specific harm. They only had to commit some act that resulted in unwanted contact. Under the law, recklessness and gross negligence can both result in a charge of battery. The person who was struck may not have been the intended party. For example, when a bar fight breaks out, a person may try to punch another. The intended victim may duck of sway, and the perpetrator may ultimately strike a third party. The perpetrator could be charged with assault for the first victim and battery for the second. There must have been some type of contact for a battery charge to stick. This rule also applies to the extended person. In other words, if a person is wearing something or holding something, their physical body doesn’t have to be touched when the perpetrator pulls or yanks the object away. The condition also applies if a perpetrator spits in someone’s drink. For example, if you are in an argument with someone and they spit in your cup of tea, you can press battery charges. There technically doesn’t have to be any harm present. A person must simply prove that the alleged perpetrator made unpermitted contact with their person in an offensive manner. Damages don’t have to be proven for a criminal case, but they do for a civil case. A person can’t be compensated if they haven’t been forced to deal with physical or emotional recovery or property damage. It’s also important to note that some cases of medical malpractice center around battery. If a person receives an unauthorized treatment or wasn’t able to provide informed consent, they may file a civil lawsuit if they choose to do so. Whether or not the person benefited from the procedure is inconsequential. When you are charged with any crime, you stand the chance of being sent to jail or prison, charged fines depending on the severity of the conviction, and may have to pay restitution to the victim. Your job could be in jeopardy, your good reputation could be ruined, and your future may ultimately take another course. If you have been charged with battery, don’t attempt to defend yourself. It takes a knowledgeable advocate to help reduce or mitigate the consequences you are facing. At Hawkins Spizman Kilgo, we have a team of Atlanta battery defense lawyers ready to represent you. We have years of experience representing people against criminal charges and have built a solid foundation in the city. Our clients can attest to our capabilities and frequently review us to family. Call our office today to schedule your free case evaluation and discover more about how we can assist you.